Crowns, Bridges, Veneers, Fillings… most tooth repairs, with no impressions, no temporary, no crown core expense, no second day appointment days or weeks later. It is simply the best for convenience, durability and material safety. CEREC stands for CERamic REConstruction. If a tooth has a part missing or is defective in any way (e.g. decayed, broken or old type crown/filling) it can be fully reconstructed the special ceramic used by the Cerec system. The Ceramic used is physically so similar to natural tooth structure it is the closest thing to a “like for like” repair rather than using a bit of filler; so meaning a stronger, longer lasting and safe repair. We have an on-site Milling machine and Ceramic Studio to make and finish cosmetic crowns and veneers whilst you wait. Having made the decision that Cerec is the best repair for your tooth at an earlier consultation where you will have been given all the options for repair and comparative costs. A Cerec preparation only requires the removal of all old filling material and any defective tooth structure (using a protective barrier to prevent old amalgam entering your mouth – the green sheet seen in this photo). This is different to conventional crown preparations where the whole tooth is usually cut back to a central peg, which is not required with Cerec. A crown core build up is also not required with Cerec, which is normally charged separately for conventional crowns. This means less drilling and less cost with Cerec. The tooth is dusted with a white reflective powder that allows the Cerec camera to capture a 3D image of the tooth and surrounding teeth. This does away with the need for regular dental impressions. The powder is completely safe being used in the food industry as white coloring. A small camera captures a series of highly accurate 3D images that the Cerec computer stitches together to form a complete virtual 3D model of your teeth around the defective tooth. Upper and lower jaws are scanned to allow the biting surface to be designed for optimal chewing and natural appearance. The dentist uses the software to design and optimal tooth part for the missing piece.This is often much smaller than most people expect as the whole tooth is not normally cut away. Also the contact with the next tooth can be accurately shaped to help prevent food trapping between the teeth. The Cerec computer sends the design to a milling machine that cuts the tooth part from a solid block of the special ceramic to an incredible accuracy of 40microns. Glazing & Colour match – the dentist can use our in-house Ceramic studio and furnace to fire permanent stains and glazes onto the surface of the ceramic to accurately mimic colour changes or discolourations of neighboring teeth. The firing process takes no more than 1-2hours so is also done whilst you wait. Adhesives are used for the strongest possible bond to the tooth structure. 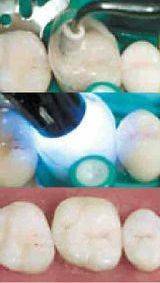 Standard crowns are often fitted with dental cements that are not adhesive relying on friction grip only. A dental curing lamp sets the adhesive fully before you leave. The excess adhesive needs to be removed and the edges polished and bite checked. A Ceramic repaired tooth. Beautifully natural and stronger than it was before it was ever damaged. The most durable, long lasting and so most cost effective tooth repair currently available. 1) Cosmetics – the porcelain can be made in several different colours and shades so can be selected to accurately match missing tooth structure or if you wish to select something whiter. Also invisible mends with no more black line joins or solid artificial appearance. If required for perfect colour match, discolourations can be painted on and fired into a permanent surface porcelain glaze in our ceramics studio and only taking an hour or so extra. 2) Convenience – as this uses a CAD/CAM system (Computer aided design & computer aided manufacture) all single tooth restorations can be made on the same day with no need for impressions. This means no temporary restorations, less complications and fewer injections as you do not need to wait days or weeks for a separate appointment. 3) Biocompatibility & safety – the ceramic used is a mineral similar to bone china with no chemicals or metals. This makes it a very natural biocompatible replacement for missing tooth structure. Alternative fillings such as composite (used for traditional white fillings) contain plastic and other chemicals; Amalgam contains various metals and mercury which are suspect when it comes to safety. 4) Material properties – the physical properties of tooth; hardness, flexibility and coefficient of thermal expansion are virtually identical to the porcelain used in Cerec. This means that the remaining tooth and adhesive are not subject to stress like other fillings. Consider existing white fillings, not only do they contract on setting but they also expand & contract differently to tooth when heated & cooled (e.g. hot/cold food or drinks) meaning that it literally pulls & pushes the remaining side walls of the tooth, leading to micro fractures or gaps around the filling which in turn can lead to pain or failure. This does not happen with Cerec. 5) Durability – Apart from reducing failure rate of remaining surrounding tooth, Cerec also actually makes the tooth stronger that it was before as there is a “laminating” effect between the tooth and the ceramic (it has twice the compressive strength of enamel). Zurich University, declared in 2007 that Cerec was the new “defacto standard material”, exceeding the durability of Gold restorations with an approximate ~85% survival rate over 18years. 6) Reduced Complications – When placing a traditional filling the stresses set up within the tooth due to expansion or contraction can lead to pain after a new filling. More often than not these would settle as the tooth acclimatised, but it has been shown that there is a 30% reduction in the incidence of root canal treatment after large Cerec restorations compared with traditional methods. 7) Natural Design – as the filling is designed by the dentist on the computer its shape more naturally mimics lost tooth structure. This not only leads to a more natural feel and appearance but also less small gaps between the teeth preventing irritating food trapping that is common with traditional fillings.